Upon arrival in Kunming, transfer to the hotel for two nights. 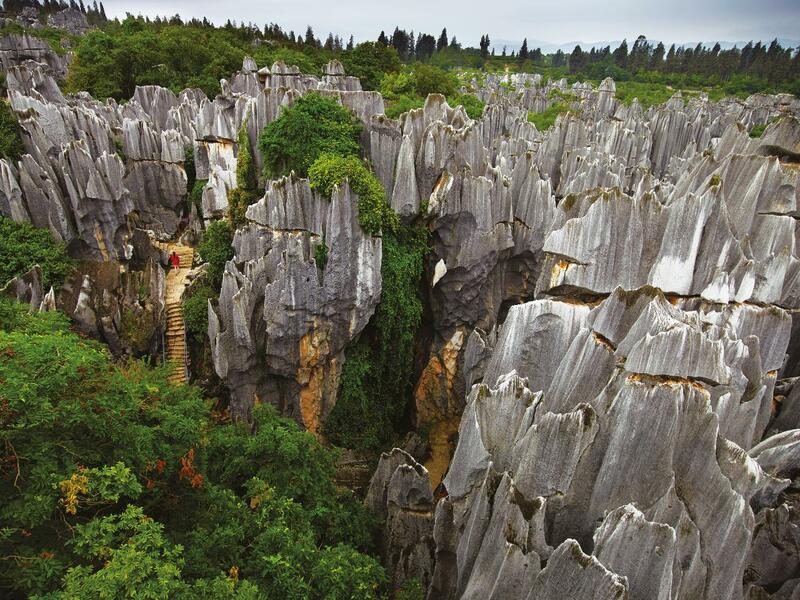 A full-day excursion to the Stone Forest, one of China’s most remarkable natural phenomena – 80 hectares of bizarrely-shaped limestone cliffs and peaks, formed by erosion after the sea bed was thrust up 270 million years ago. Fly to Lijiang where you will spend two nights. The old city is a “living museum” with ornately carved wooden buildings and teahouses and its maze of cobbled streets criss-crossed with canals. Visit the Black Dragon Pool Park set against the backdrop of Jade Dragon Snow Mountain. Today, you will visit the Yufeng Lamasery where you can admire the 500-year old Camellia Tree. Take a chairlift up Jade Dragon Snow Mountain where you can explore the mountain areas and enjoy the variety of highland. Take a scenic drive to the First Bend of the Yangtze River before continuing to one of the world’s deepest gorges, the Tiger Leaping Gorge. Travel onto Zhongdian where you will spend three nights at the Songtsam Retreat. A full-day visit to the 300-year old Gadan Songzalin monastery which was styled after the Potala Palace in Lhasa. See the blossoming flowers and lush grasslands of the Napa Lake Reserve, and visit a typical Tibetan village. A full-day visit to the Bita Lake Nature Reserve, hidden in dense forest at an elevation of 3540 metres. Around the lake are virgin forests that are home to wild animals and birds such as red footed pheasants, red deer, lynxes and squirrels. Fly back to Kunming where you will stay overnight.